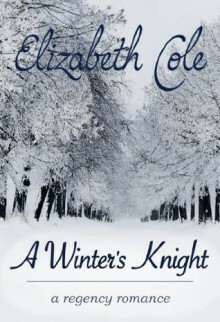 Introduce yourself to the wit and charm of Elizabeth Cole with A Winter's Knight!A SWEET REGENCY NOVELLAA wounded Royal Navy captain tries to find love in the face of his self-doubt... Phoebe Hartridge runs into serious danger on an icy winter evening. But her rescuer, the mysterious Anthony Sterling, immediately melts her heart and makes her dream of a life beyond her tiny, sheltered world. The more she gets to know him, the more she senses he is hiding something from her.When Captain Anthony Sterling was wounded at Trafalgar, he lost his leg, his fiancee, and any hope for happiness. Even the revelation that he is the heir to a fortune brought him nothing but bitterness. Then his chance encounter with the charming, innocent Phoebe makes him wonder if there may be a future for him after all. But first he must escape the shadows of his past.Can Phoebe bring her winter knight out of the past and back into the light?